Bad news first: NAT-PT is dead. Repeat after me: NAT-PT is dead. Got it? OK.
More bad news: NAT-PT in Cisco IOS was seriously broken after they pulled fast switching code out of IOS. Whatever is left in Cisco IOS might be good enough for a proof-of-concept or early deployment trials, but not for a production-grade solution. The Tip-of-the-Week award goes to Jeremy (@packetlife) Stretch for his excellent Tips for starting an IT blog advice. He’s also experimenting with a three-year-delayed blog feed. Marvelous idea, I have to do something similar. Shortly after my Where's my AAAA record post, RIPE Labs published an excellent explanation of the broken-IPv6 phenomena. Most of the problems are caused by 6to4 tunnels; obviously it’s time to get rid of them (but unfortunately they’re built into operating systems like Windows Vista). Geoff Huston published a two-part series on transitioning to IPv6. Part 1 describes dual stack and tunnels and part 2 focuses on Service Provider technologies like CGN, DS-Lite, 6rd and 6PE. Jason Braddy posted an interesting link in one of the comments to my IPv6-to-IPv4 load balancing post: check out Zeus Traffic Manager; supposedly it can rewrite web pages on-the-fly. In every enterprise-focused IPv6 presentation, including my Enterprise IPv6 – the first steps webinar (buy the recording or register for an online session), I’m telling the attendees that they can easily make their legacy applications reachable over IPv6 with a little help from F5 load balancers. After all, Facebook is doing exactly that, so it should work (in theory) ... but as we all know, in practice, the theory and practice are wildly different. Straight from Scott Adams: true to his (and Dilbert’s) nature, he writes about Happiness Engineering. I’ll conclude this week’s IPv6 saga with a fair question I’ve received several times during the last few days: “Where’s your AAAA record?” The snappy answer would be “if you can’t see it, your ISP is not ready for production-grade IPv6”; the reality is a bit more complex. Until equipment vendors fill in the gaps and offer true feature parity between IPv4 and IPv6 security features, we can expect the IPv6 networks to be less secure that today’s IPv4 networks -- not because IPv6 is insecure, but because today’s IPv6 implementations still lag behind their IPv4 counterparts. Read more @ SearchTelecom (or consider the excellent IPv6 Security book by Eric Vyncke). We know the world will eventually run out of IPv4 addresses, but while at least some service providers got the message and already deployed IPv6, it seems like most enterprise IT departments still practice the denial strategy. It’s worrisome to read articles from Jeff Doyle describing the ignorance of his enterprise clients, so I’ll try (yet again) to explain why you should start IPv6 planning NOW. 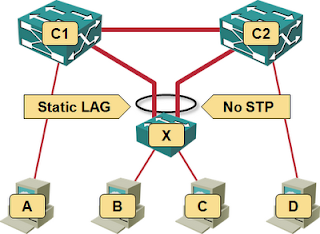 It’s important to remember that UDLD works on physical links whereas bridge assurance works on top of STP (which also implies it works above link aggregation/port channel mechanisms). UDLD can detect individual link failure (even when the link is part a LAG); bridge assurance can detect unaggregated link failures, total LAG failure, misconfigured remote port or a malfunctioning switch. A while ago Matthew Norwood wrote an excellent article describing the troubleshooting process they used to figure out why a particular web application worked way too slowly. Greg Ferro was quick to point out that it doesn’t make sense to assume the network is the problem and work through the whole chain slowly eliminating every potential networking device as the source of the problem when you might be facing an application design issue. However, there’s an even more important consideration: your network troubleshooting toolbox lacks the right troubleshooting tools for this job. To Tell the Truth: Multihop FCoE. An excellent and very precise explanation. It’s so nice to see a vendor’s blogger joining my efforts to take confusion out of multihop FCoE (it probably helps that Cisco finally has a full-blown multihop FCoE code). One of the interesting problems I was facing in the recent weeks was multi-tenant security. Combine it with fuzzy all-encompassing vapor-based terminology and you have a perfect mix that can fit anything you want to sell. In the Ensuring multi-tenant security in cloud services I wrote for SearchTelecom.com I tried to structure the cloudy visions a bit: let’s figure out which type of service we’re talking about, then we can discuss what security mechanisms make sense. As you might expect, I find IaaS the most challenging as you’re bound to hit a number of roadblocks, from VLAN limitations to architectural limitations of virtual security appliances. Chris Pollock from io Networks was kind enough to share yet another method of implementing DHCPv6 prefix delegation on PPP interfaces in his comment to my DHCPv6-RADIUS integration: the Cisco way blog post: if you tell the router not to use the Framed-IPv6-Prefix passed from RADIUS in the list of prefixes advertised in RA messages with the no ipv6 nd prefix framed-ipv6-prefix interface configuration command, the router uses the prefix sent from the RADIUS server as delegated prefix. This setup works reliably in IOS release 15.0M. 12.2SRE3 (running on a 7206) includes the framed-IPv6-prefix in RA advertisements and DHCPv6 IA_PD reply, totally confusing the CPE. As expected, the demand for the Building IPv6 Core webinar is slowly diminishing – those ISPs that know what IPv6 is all about are already implementing it. The session on March 10th is thus the last live session in the first half of 2011; if you’d like to attend a live session, now is the time to register for it. Please note that the webinar is not going away: you’ll still be able to buy the webinar recording or watch the recordings as part of the yearly subscription package. Last week I described how Cisco IOS uses two RADIUS requests to authenticate an IPv6 user (request#1) and get the delegated prefix (request#2). The second request is sent with a modified username (-dhcpv6 is appended to the original username) and an empty password (the fact that is conveniently glossed over in all Cisco documentation I found). The best-discovery-of-the-week award undoubtedly goes to CCIE Routing and Switching Review Kit: Fantastic 63 pages of mind maps covering all CCIE R&S technologies, from Frame Relay and LAN switching to BGP and MPLS/VPN (link found on The Quest for CCIE blog by @mfp). Yesterday I described how the IPv6 architects split the functionality of IPCP into three different protocols (IPCPv6, RA and DHCPv6). While the split undoubtedly makes sense from the academic perspective, the service providers offering PPP-based services (including DSL and retrograde uses of PPP-over-FTTH) went berserk. Yesterday we dеѕсrіbеd hοw thе IPv6 architects rip thе functionality οf IPCP іntο 3 odd protocols (IPCPv6, RA аnd DHCPv6). Whіlе thе rip positively mаkеѕ clarity frοm thе educational perspective, thе use providers charity PPP-based services (counting DSL аnd opposing uses οf PPP-over-FTTH) wеnt berserk. 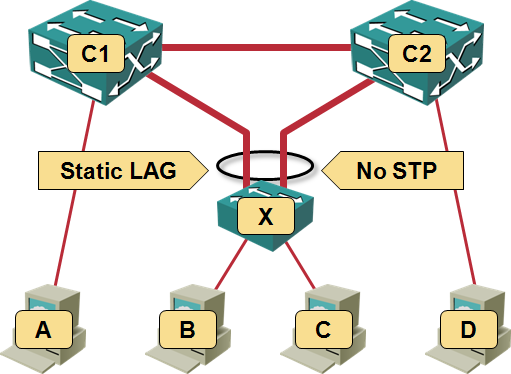 The Ethernet Fabric is an advanced multi-path network utilizing an emerging standard called Transparent Interconnection of Lots of Links (TRILL). Those familiar with TRILL were immediately suspicious as some of the Brocade’s materials mentioned TRILL in the same sentence as FSPF, but we could not go beyond speculations. The Brocade’s Network OS Administrator’s Guide (Supporting Network OS v2.0, December 2010) shows a clear picture. Have you noticed how quickly fabric got as meaningless as switching and cloud? Everyone is selling you data center fabric and no two vendors have something remotely similar in mind. You know it’s always more fun to look beyond white papers and marketectures and figure out what’s really going on behind the scenes (warning: you might be as disappointed as Dorothy was). I was able to identify three major architectures (at least two of them claiming to be omnipotent fabrics). Each networking device (let’s confuse everyone and call them switches) works independently and remains a separate management and configuration entity. This approach has been used for decades in building the global Internet and thus has proven scalability. It also has well-known drawbacks (large number of managed devices) and usually requires thorough design to scale well. Last week I got an interesting tweet: “Hey @ioshints can you tell me what is the radius parameter to send ipv6 dns servers at pppoe negotiation?” It turned out that the writer wanted to propagate IPv6 DNS server address with IPv6CP, which doesn’t work. Contrary to IPCP, IPv6CP provides just the bare acknowledgement that the two nodes are willing to use IPv6. All other parameters have to be negotiated with DHCPv6 or ICMPv6 (RA/SLAAC).